Indiana Bats - Pittsburgh Wildlife & Environmental, Inc.
A Project Review is used to identify if any environmental conflicts or known listed species have the potential to occur within your project area. Using our years of experience, public records, and knowledge of listed bat populations, we are able to complete an informal Project Review quickly. This informal Project Review is done internally and is not coordinated with state or federal agencies. 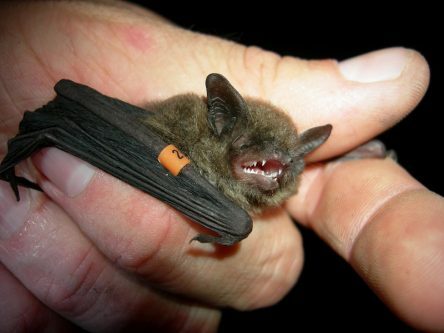 Early identification of potential listed bat conflicts can help guide future project decisions and allow us to create an overall project schedule with project milestones. Time restraints can occur based on your project’s location in reference to bat management areas, which we help to identify during this service. Knowing about these areas in the beginning of a project will allow us to determine if you need to clear trees during the winter or if you have to complete a survey during the summer. A formal Project Review is coordinated with both state and federal agencies. The information obtained by this investigation is sufficient for environmental permitting and also can help guide you in property acquisitions, project citing, or project routing. Completing a Project Review early in your planning phase will identify any potential conflicts with listed species. PWE is prepared to discuss your options and any alternatives based on these reviews. Building upon the initial Project Review, PWE can advise you on whether formal consultation under the Endangered Species Act (ESA) should be initiated or if informal consultation will be sufficient. Typically, most projects fall under informal consultation. This informal consultation is used by the agencies to determine what your project is, where it is at, and if it may adversely affect listed species. For a majority of the projects we deal with, we are able to complete the project review, identify a potential avenue to speed up consultation and then conclude agency consultation within 30 days. For some of the projects we deal with, additional information is requested by the agencies. This additional information can range from Habitat Assessments or Surveys to the creation of Conservation Plans (CPs) or Protection and Enhancement Plans (PEPs). In some instances, during informal consultation it is identified that a proposed project is likely to adversely affect one or more listed species. At this point we recommend meeting with the agencies to discuss potential options or entering into formal consultation. Formal consultation under the ESA is divided into two paths, Section 7 consultation and Section 10 consultation. Consultation between two federal agencies (usually the USFWS and the USACE) falls under Section 7 of the ESA. Consultation between a private organization and the USFWS falls under Section 10 of the ESA. These paths differ slightly but if successfully completed, both result in the issuance of an Incidental Take Permit. If you’d like to discuss formal consultation further, please contact us and we can help advise you with the next steps. For projects located within the known range of a listed bat or if an agency requests additional information – a Habitat Assessment is typically the next step. PWE has years of experience working with bats and we have the skills to make this a very quick and straightforward step in the consultation process. Habitat Assessments typically include literature searches and on-site assessments. Our initial assessment focuses on the presence of potential habitat for listed bats or lack thereof. Potential habitat can include forested areas, man-made structures, abandoned mines or caves, cliffs, rock piles, or even individual trees. 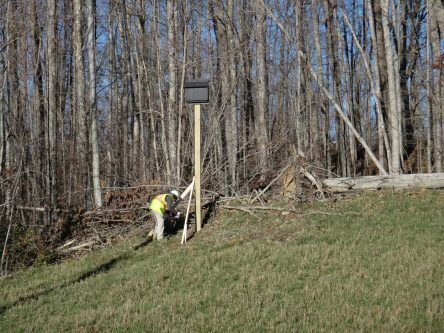 PWE will determine if there is potential foraging, roosting, or winter bat habitat in your project area. If present, we can then discuss the need for further surveys and which survey type provides the best options for the completion of your project. 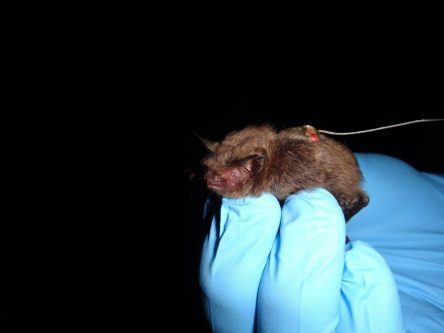 Emergence Surveys are used to determine if any bats are using a small number of trees or to determine the colony size of bats using a specific tree identified during Telemetry Surveys. The USFWS protocol for this survey specifies two nights of Emergence Surveys per tree or group of trees under suitable weather conditions. If an Emergence Survey is being done to determine if any bats are using a small number of trees and no bats are seen during the 2nd night you must clear the small group of trees on the 3rd morning. If you are doing an Emergence Survey to determine the colony size of bats using a specific tree identified during Telemetry Surveys, this service is to be continued for each new roost tree identified. Summer Mist Netting Surveys have long been the standard tool to determine species presence or probable absence during the maternity season (May 15 – August 15). PWE has completed Mist Net Surveys ranging in size from 1 site for an access road to 535 sites for a transmission line. Our team leaders are all approved USFWS Indiana bat surveyors with a federal range-wide collection permit and carry all the necessary state collection permits to complete Mist Net Surveys. 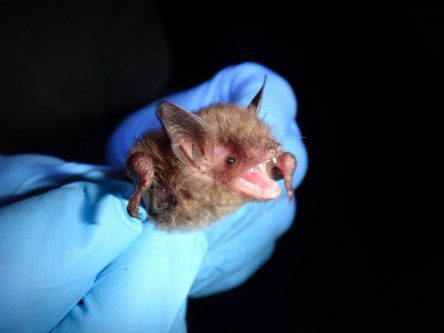 These surveys are also used to determine presence or probable absence of the Northern Long-eared bat, Gray bat, Virginia Big-eared bat, and Eastern Small-footed bat. 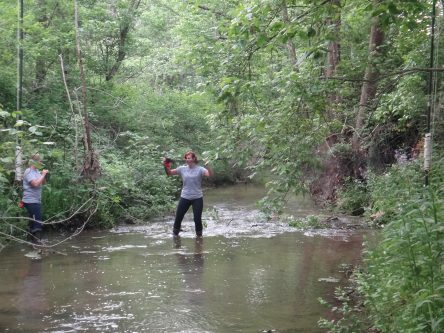 During Project Reviews, Habitat Assessments, and Surveys we are required to search for potential winter bat habitat. 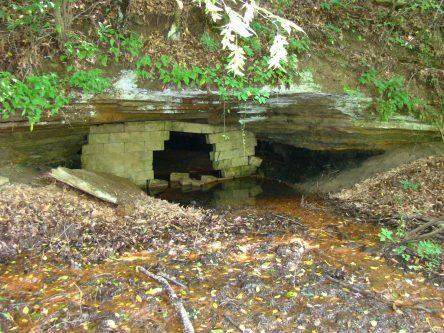 Winter bat habitat consists of abandoned mines, caves, old tunnels, and military bunkers. If potential winter bat habitat is found within or adjacent to your project area the USFWS will likely recommend a fall swarm Portal Survey. Identified portal entrances are surveyed by placing a harp trap in front of the open portals in a manner that optimizes bat capture. 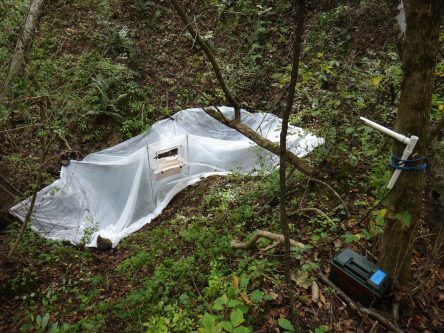 Once the harp traps are placed, the area surrounding the portals is completely sealed with plastic sheeting with only an opening into the harp trap. Once setup, the only entry/exit point for the portal is through the harp trap. While completing a Portal Survey, PWE also uses bat detectors to periodically monitor bat activity and efficiency of the survey. 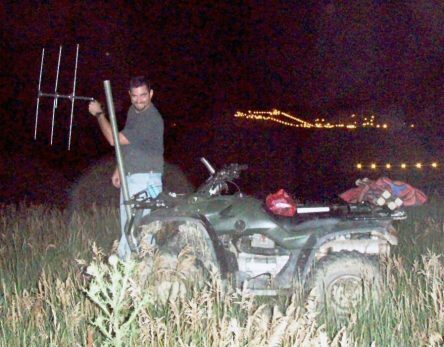 Acoustic detection surveys are sometimes used in place of or as a supplement to capture surveys for bats. Trying to decide which type of survey best fits your needs can be complicated, and we are confident that we can guide you through the decision making process to determine the right type of survey for your project. If an acoustic survey is best for your needs, PWE employees are trained to use many of the popular acoustic detection devices and software types currently available. If your project has specific acoustic detection equipment or software requirements, we are happy to assist you. 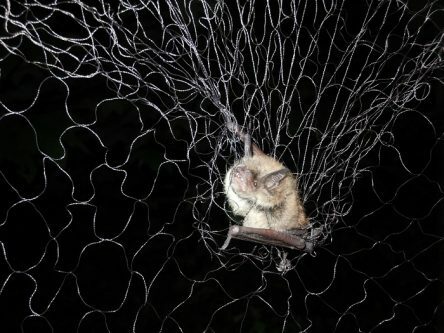 In the event that an Indiana bat or other species of concern is captured, PWE will affix a radio transmitter to the bat and then use radio telemetry equipment to locate and track the bat’s movement. Agency requested radio telemetry requirements can differ by which state you are located in as well as what species of bat has been captured. Typically, if an Indiana bat is captured the USFWS requests that you, at a minimum, track the bat to its daytime roost and complete Emergence surveys to document the total number of bats using the roost tree. This survey is completed for a minimum of 7 days unless the transmitter fails. In addition to documenting Indiana bat roost trees and population numbers, PWE also documents foraging areas and travel corridors. This information combined with the roost tree and population information can provide a much greater understanding of the local Indiana bat population and how it could interact with your project. 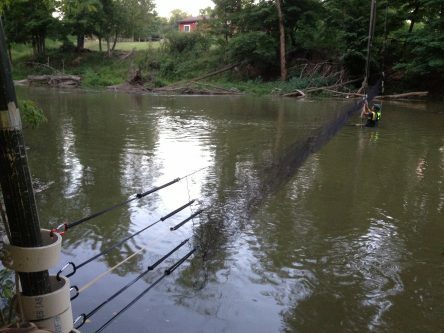 Every PWE team is outfitted with the necessary equipment to tag and track an Indiana bat safely and effectively. For projects that are located within a known listed bat management area, presence of the listed bat is assumed. Additionally, depending upon your overall project, you may also have the option to assume presence of a listed bat. For coal mining projects, the Office of Surface Mines and the USFWS have already completed formal Agency Consultation. Based upon this consultation the USFWS has determined that coal mining will not adversely affect listed species if certain prudent measures are employed during the permitting, operation, and reclamation of the mine. Under this framework, USFWS field offices and state mining agencies have developed the Protection and Enhancement Plan (PEP) to guide mining applicants. Working under informal Agency Consultation the USFWS has adapted the guidelines of a PEP to apply to other industries in the form of a Conservation Plan (CP). By developing a CP, you can receive agency concurrence that your project will likely not adversely affect listed bat species if you can adhere to standard avoidance, minimization, and Mitigation measures. For Conservation Plans we will help you develop a construction and operation plan which avoids direct take of listed bats and minimizes indirect take. 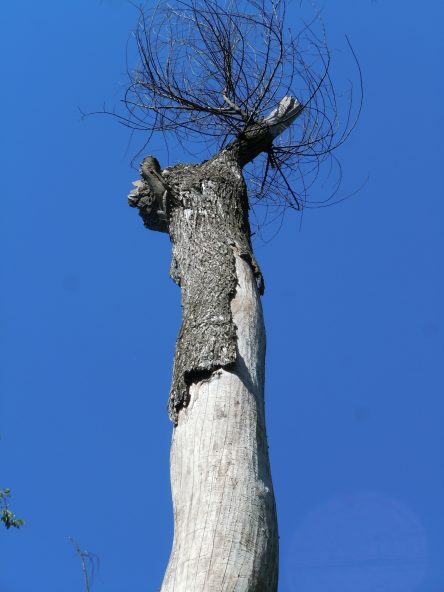 Direct take is avoided by clearing during the hibernating season, maintaining high quality bat habitat areas, and maintaining the overall habitat quality within the area for bats. Minimizing indirect take can include collocation of project components, minimizing disturbance areas, limiting tree removal, clearing trees in phases, avoiding impacts to aquatic resources, buffering sensitive areas, and maintaining strong E&S controls. The final component to a CP or PEP is Mitigation. PWE has completed CPs and PEPs for a multitude of projects ranging from small commercial developments, to O&G infrastructure, to large coal mines. Over the last few years we have covered over 133 miles of ROW and over 1,100 acres of development with CPs or PEPs. For projects that may result in direct or indirect impacts to listed bats, Mitigation may be part of your CP/PEP or a part of your Incidental Take Permit. Mitigation can be completed in a multitude of ways including conservation banks, private land preservation, deed restrictions, reforestation, cave gating, bat box erection, tree girdling, forest management, tree planting, research funding, and invasive species control. PWE has helped clients develop comprehensive Mitigation plans for industrial wind farms, mines (surface and deep), intrastate transmission lines (electric, oil, and gas), quarries, and development projects. PWE has helped our clients with a wide array of Mitigation, and we can help you with whatever type of Mitigation suits your project’s needs. PWE completes Monitoring of known listed bat populations, Mitigation measures, and winter bat populations throughout the Northeast and Midwest. Mitigation plans should outline the mitigation to be completed as well as your performance criteria. PWE’s staff has the experience to assess completed mitigation, identify deficiencies, and provide recommendations on how to reach and maintain your performance criteria. We can also complete Monitoring to document bat populations within and around your project in order to provide baseline data and document local bat population trends.